Ignorant? Stupid? Or agent provocateur? My late brother underwent a brain surgery in Sydney four years ago this month because the congenital condition called arteriovenous malformation was the largest any neurosurgeon had ever seen here. I was there for about two weeks to encourage his post-surgery progress. One morning as I walked from the hotel across the street to the hospital I saw a man, evidently recovering from a keyhole prostate surgery standing outside the hospital building smoking a cigarette. He was from Ireland and was in Sydney for a holiday when he had to undergo an immediate surgery. 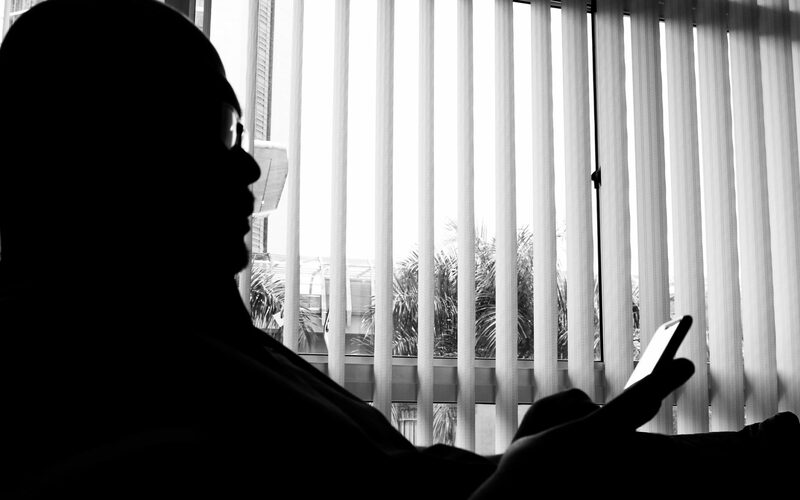 It costs RM1.00 for a person seeking outpatient treatment to see a doctor, and RM5.00 to see a specialist. The medicines are given for free. Surgeries would cost a bit more. My daughter underwent an appendectomy and that cost me less than RM100.00. No doubt she had to be in an open Class 3 ward but the pre and post surgery care was better than in most of the private hospitals I have been admitted to. A foreigner would have to pay a lot more. Even then it would still be cheaper than seeking treatment at a private hospital in Malaysia. My former maid fell and broke her forearm and I was forewarned that it would cost me a lot to send her for treatment at a government hospital. It cost me about RM1,200 if my memory serves me right to have her undergo surgery to have her broken bone screwed into place. The Full Paying Patient is a program that allows someone who could afford such luxury, or has a good medical insurance scheme, to obtain virtually personal medical care at a government hospital at a very competitive price. Not only that, if you or those close to you suffer from cancer, there is a National Cancer Institute that provides treatment at very affordable price. Among other initiatives that have been taken by the government is providing Human Papillomavirus (HPv) vaccination to 13-year old schoolgirls and young women nationwide for free. Mind you, each injection costs RM600.00! And Malaysia is among the first countries in this region to implement such a program. I am also baffled by complaints by fellow veteran servicemen about the lifetime allowances given to athletes who excelled during the Olympics and Paralympics in Rio de Janeiro recently. What the veterans never realise is that apart from the monthly pension that they receive (for those who served until pensionable age) the 85,000 veterans receive free medical care for the rest of their life and that definitely costs more than the RM3,000 that is given to less than twenty athletes. Imagine the cost the government has to fork out as a token of appreciation for services rendered. In the latest 2017 Budget announced by Prime Minister Najib Razak today the government continues to put importance to health of the veteran servicemen and the rakyat‘s. RM55 million have also been allocated to help veterans handicapped during the counter-insurgency periods. 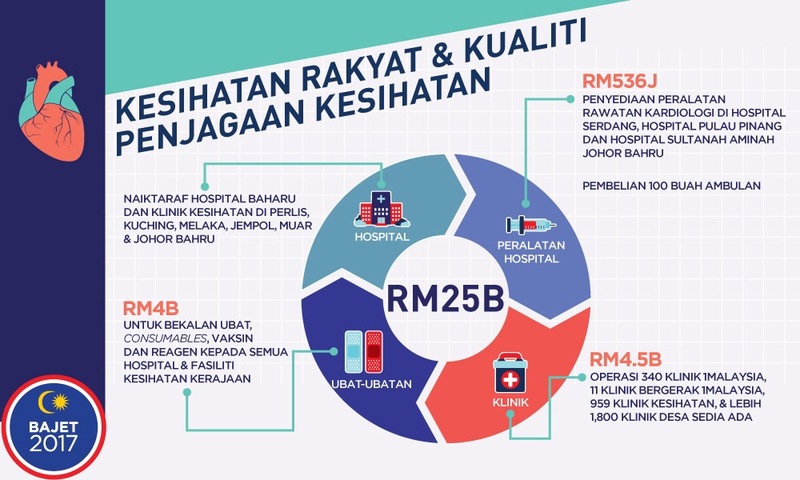 RM25 billion have been allocated for the upgrading of hospitals and government clinics, provision of equipment for cardiology treatment, and the operation of Klinik 1Malaysia, mobile Klinik 1Malaysia, government clinics and also rural government clinics. 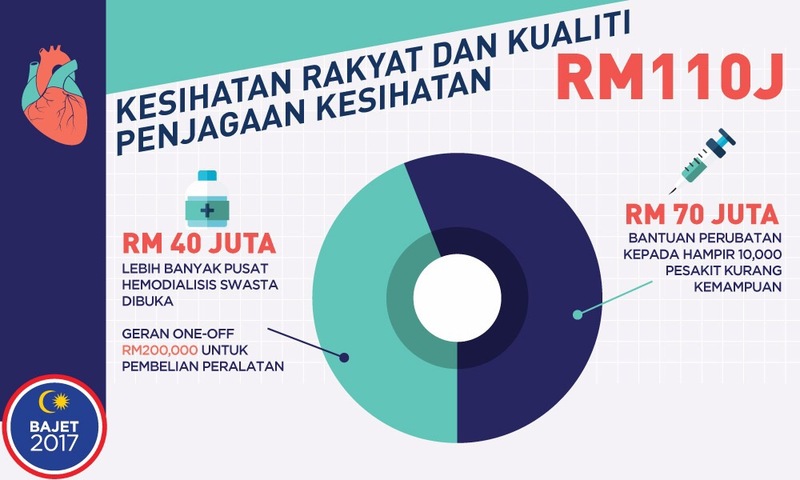 On top of that RM110 million have been allocated to open up private haemodialysis centres and to assist almost 10,000 people who cannot afford medical care. Now who says that the government does not care for the well-being of the rakyat? A certain nonagenaric has-been politician even said the government has no money to help the rakyat. 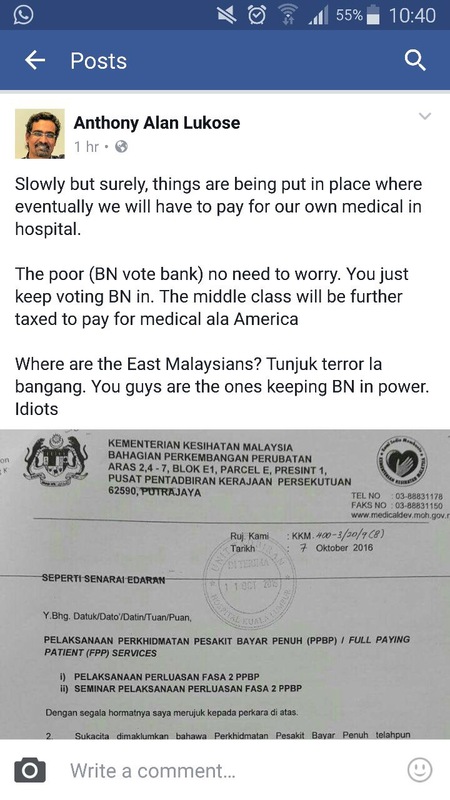 Probably due to his age he has forgotten that his medical bills for the repeated treatments at the National Heart Institute is all paid for by the government of Malaysia led by Najib Razak. As the Malay saying goes: “Kufur Nikmat.” Which is why I often laugh at him nowadays.